Richie of Richie’s Deli raffled off a ticket to Sunday’s Phillies game. Bill Gant never thought he’d be in the stands during the World Series. The raffle raised at Richie’s more than $1,000 for the Childrens Alopecia Project (Il Cho/TTN). But Sunday night, the dream of attending one of the biggest Phillies games since 1993 came true. Gant, the winner of a raffle for Game 4 tickets held by Richie’s Deli and Pizza, was able to see the Phillies host the Tampa Bay Rays at Citizens Bank Park in South Philadelphia. 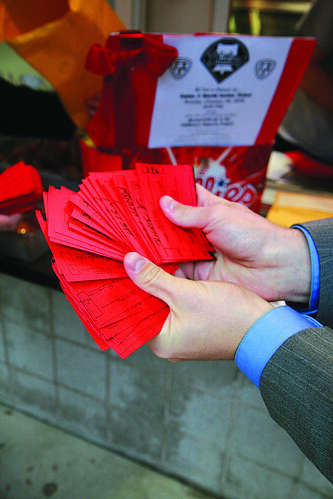 In coordination with Gamma Iota Sigma, a professional fraternity for risk management, insurance and actuarial science majors, Richie, the deli’s owner, sold $5 raffle tickets for four days at his stand in the Anderson food pad. The proceeds went to the Children’s Alopecia Project, a charity to which Gamma Iota Sigma has been donating all year. Amanda Dolan, the senior risk management major who helped Richie organize the raffle, said the idea to donate to the Children’s Alopecia Project came from a conversation she had with Richie two weeks prior to the raffle. The drawing took place on Friday at 5:30 p.m. in front of Richie’s Deli and Pizza. Some students recognized the importance of supporting a good cause whether or not they are baseball fans. 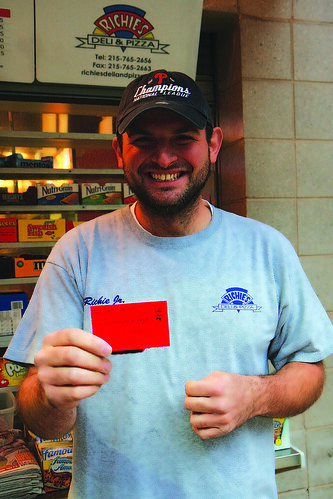 Richie of Richie’s Deli raffled off a ticket to Sunday’s World Series game at Citizens Bank Park (Il Cho/TTN). “I bought a raffle ticket from Richie’s, not because I wanted to go to the Phillies game, but because of the cause they were supporting,” said Colleen Reinert, a junior university studies major. Ester Roche Curet bought a ticket, and while she was excited about the possibility of going to a World Series game for $5, she said she was more interested in donating the money. “It’s a win-win because the money goes to charity,” said Curet, a junior education major. The game was Sunday evening, where the Phillies beat the Rays in thrilling fashion, hitting four home runs and winning 10-2. In addition to game tickets, the raffle included a free Richie’s T-shirt, a free Phillies World Series T-shirt and hat and dinner supplied by Richie’s. Altogether, the raffle raised more than $1,000 for the charity. Morgan Zalot and Kevin Brosky can be reached at info@temple-news.com. Richie’s was included in the episode “College Town Cravings” after the network noticed his food on social media.